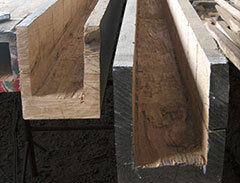 Our oak fireplace beams can be hand-picked in almost all cross-sections and lengths. Fireplace beams come in reclaimed and air-dried oak, so there is a choice of both traditional and contemporary looks. Fixing kits are also available. 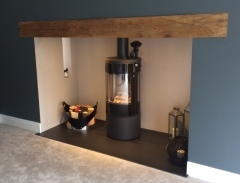 Made to measure beams are available to order or take a look at our fireplace beam shop for beams which are available to buy today. Beams from our online shop can be cut to your specific length and are available for immediate dispatch. Inglenook fireplaces, lintels for log burners, sitting room mantels and shelving. Air dried oak beams are machine-sawn and straight. 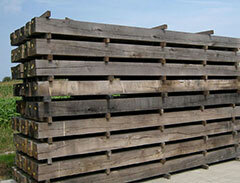 They have had no prior use and can be re-cut to specified dimensions. The longer these beams have been air dried the more stable and less prone to movement and cracking they become. 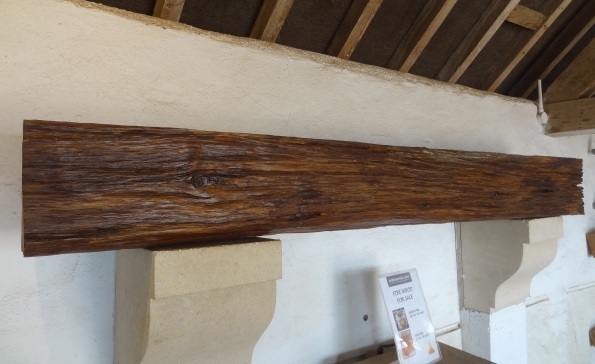 These can be purchased in their raw weathered state, alternatively we also offer a full preparation service which includes cleaning, chamfering and waxing of the beams ready for installation. New builds, extensions, garages, pergolas. Air-dried oak is more stable and less prone to warping and splitting than ‘green’ oak which can move once installed very significantly. Reclaimed oak beams have had a previous use and have three advantages: they are dry and stable therefore less prone to any movement; the tone of the oak has matured to a rich highly desirable colour and they have real character with knots, twists and evidence of their previous lives. Decorative and cosmetic use where character and age is the priority. Reclaimed beams can be finished to closely match pre-existing timbers. Oak beams to clad RSJ’s have been especially selected for their straightness and are bespoke cut so that the core of the wood is removed to create an original ‘U’ or ‘L’ shaped casing, often used to enclose a steel RSJ or other structure which needs to be camouflaged. Profiled beams allow unsightly architectural features such as steel lintels and electrical ducting to become stunning period features clad within real oak beam casings. 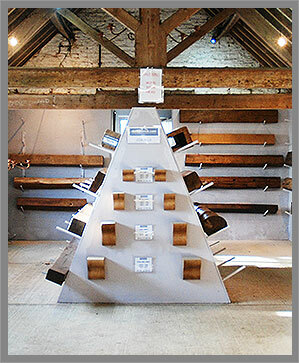 Oakbeamuk.com is a specialist stockist for reclaimed and finished air dried oak. Some 3,000 oak beams are held and worked on at converted farm premises close to Cirencester in the heart of the Cotswolds, some 90 minutes West by road from the centre of London. The company is privately owned by John Rawlinson (john@oakbeamuk.com) and has 6 full time employees and a wider pool of craftsmen who contribute their expertise in selecting, cutting, preparing and finishing oak sections to specifications from a variety of clients, including some of the world’s best known designers, architects, builders and private individuals. 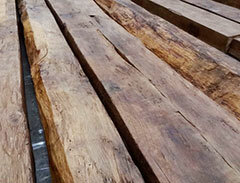 We specialise in the finest reclaimed oak boards which offer authentic character, rich and varied colour tones and the unique patina of age that simply cannot be faked. Every board is cleaned, formatted to standardised widths, treated for infestation and finished with a variety of oils and waxes according to client preference. Each of our old floors add authenticity and great beauty to any restoration project and are of a quality that set them apart from standard “new” oak flooring. Beautiful hand finished door stops in both seasoned and reclaimed oak. These can be purchased via our dedicated door stop online shop. Largest stock of oak beams in the U.K. This beam is priced at £500 inc VAT. To make an enquiry please click here.